Scott Xylo - Find Us When U Get There. Vinyl LP. Bleep. Find Us When U Get There is a record of psychedelic, Afrofuturist neo-soul jams that have a touching homeliness to them. The American hip-hop school of Stones Throw/Brainfeeder has clearly had a big influence on this young Leicester-based artist. 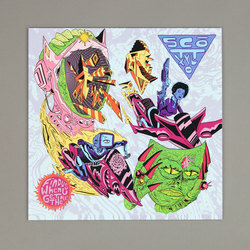 There’s also plenty of the new wave of London jazzers - Shabaka Hutchings, Ezra Collective - to this charming record. ‘Ariya’, for instance, is a wobbly sample-soul thing that wiggles with loose-limbed energy. Scott Xylo has found a good match for his sound in the form of new label Black Acre (Cervo, Romare).